In general, I think the theory that our taste buds changed every seven years is true. When I was little I didn’t care too much for tomatoes, but now I like them for the most part. Except, I still hate the squishy guts inside. I love the idea of stuffing tomatoes and baking them till they are slightly soft. This is probably because I have a slight obsession with stuffing items with delicious concoctions. It’s safe to say that anything stuffed makes me happy. And if you pair something stuffed with any kind of dip or sauce, I have seriously died and gone to heaven. Anyway, this recipe can do triple duty in your kitchen. It can be served as a main course, an interesting side dish, or if you use roma tomatoes, it can be a great appetizer. This makes 4 large vine-ripe or beefsteak tomatoes, but if you want to make it as an app, go with about 6 roma tomatoes and halve them. Even though my cheese got a little too browned, I couldn't not share these with you. 1. Start by sautéing the onion in the olive oil over medium heat for 5 minutes. Next add sausage and garlic. Sauté until sausage is fully cooked and brown. Remove from heat and allow to cool slightly. Meanwhile, slice the top part of each tomato and fully cleaning out the inside. Sprinkle each with a small amount of pepper and garlic salt and set aside. 2. Once sausage has cooled add spinach, breadcrumbs, and parmesan cheese. Season lightly with pepper and salt. Stuff an even amount of mixture into each tomato. Top with mozzarella cheese. 3. Bake in a 375 degree oven for 20-25 minutes or until mozzarella is browned and tomato has wilted slightly. Cover tomatoes loosely with foil until the last 5 minutes. This will help prevent the cheese from being too browned – like mine. Thoughts: I turned my back on these for a moment and my cheese was a little browner then I usually prefer. So “picture-wise” that was a flaw, but other than that these were really great. The tomatoes were juicy and tasted like a fresh sauce. The stuffing had just enough moisture and wasn’t mushy. And the sausage and spinach filling was a nice pairing to the sweetness of the tomato. 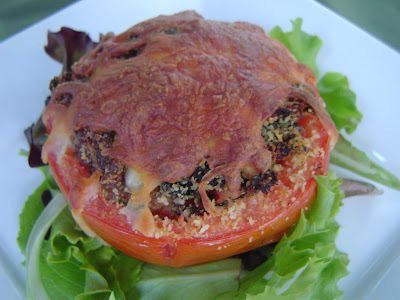 We enjoyed these will a simple side salad for a light dinner, and it was perfect for a warm spring night.